Perus Pomppa var den første modellen designet av Pomppa. Målet var å designe ett dekken som beskyttet hunden uten å begrense bevegeligheten. Perus Pomppa er et hverdagsdekken som holder hunden din varm hele året. Det vanntette dekkenet med anti-statisk teddyfor vil holde hunden din komfortabel, både i regn, våt snø og på veldig kalde dager. PerusPomppa is Pomppa’s first product. Its carefully designed details are replicated in all Pomppa coats. 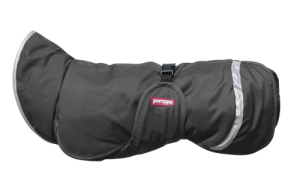 PerusPomppa does not restrict your dog’s movement, and it stay put even in full force action. 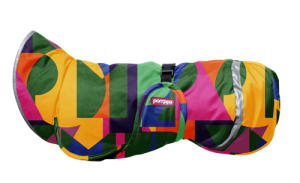 PerusPomppa fits many kinds of dogs. A generous collar, back vent and a broad abdominal panel, which is fastened as a belt, make the coat well-fitting. Pomppa is designed with the dog’s wellbeing at heart. It is easy to put on and comfortable to wear. All Pomppa coats and jackets use the waterproof outer fabric. Its colours vary according to season. A high-quality and anti-static teddy lining will not tangle your dog’s fur or collect hair or dirt. The lining is made of teddy with a close texture, which makes it warm and durable. Reflectors on the collar and along the back seam guarantee that your dog is seen in the dark.